Upon entering Victory Plaza at Georgia State Stadium, the first clue you will have that this is no run-of-the-mill Division 1 football stadium is just to the left of the ticket office. There you will see a statue of the great home run king (sorry, Barry), Henry “Hammerin’ Hank” Aaron. Of course, Aaron played baseball, not football. He also didn’t play for Georgia State. But like Georgia State, Aaron played a critical role in breaking down barriers in a city that is great, yet often divided. Aaron endured unspeakable racism, including countless death threats, on his way to breaking Babe Ruth’s home run record while playing for the Braves at Atlanta-Fulton County Stadium. Now, just across the street, his statue stands in the plaza of the football stadium for Georgia State University, which U.S. News & World Report ranks as one the top ten most racially and ethnically diverse universities in the nation in its 2019 Campus Ethnic Diversity rankings. (Georgia State scores a .72 on a a diversity index ranging from 0 to 1). It is a great reminder to see Aaron’s statue still standing at Georgia State Stadium. Despite what he experienced, Aaron broke Major League Baseball (MLB)’s home run record. Georgia State is giving opportunity to students of diverse backgrounds to become the “Hank Aaron” of whichever field they choose. On multiple occasions in Atlanta, perfectly good stadiums have been left behind or demolished (R.I.P. Georgia Dome). However, it turns out the Braves did Georgia State a favor by moving to Cobb County. By not tearing down The Ted and instead choosing to refurbish it, Georgia State is now playing an important role in preserving (and building on) Atlanta’s history—a history that includes the 1996 Summer Olympic games, which held its opening and closing ceremonies in the same building that Georgia State football now calls home. Atlanta’s place in sports history shouldn’t be dismissed. In fact, only five other American cities have hosted the Olympics. The Braves even won the World Series here in 1995. Slowly, the stadium has transformed from an MLB stadium into a sizable (certainly by Group of 5 standards) Division 1 football home. And it hasn’t just been outside contractors doing the work, either. Student-athletes and Georgia State Athletics staff (full disclosure: I am an intern in the Georgia State Athletics ticket office) alike have rolled up their sleeves, renumbered stadium seats and done a lot of painting (guess which color). There’s something to be said for the camaraderie and good ol’ fashioned elbow grease of student-athletes and staff involved in transforming The Ted into Georgia State Stadium. It should also be seen as a good sign to residents of Summerhill and Mechanicsville. Georgia State was not exactly welcomed with open arms by neighborhood residents when it acquired the stadium and surrounding lots. 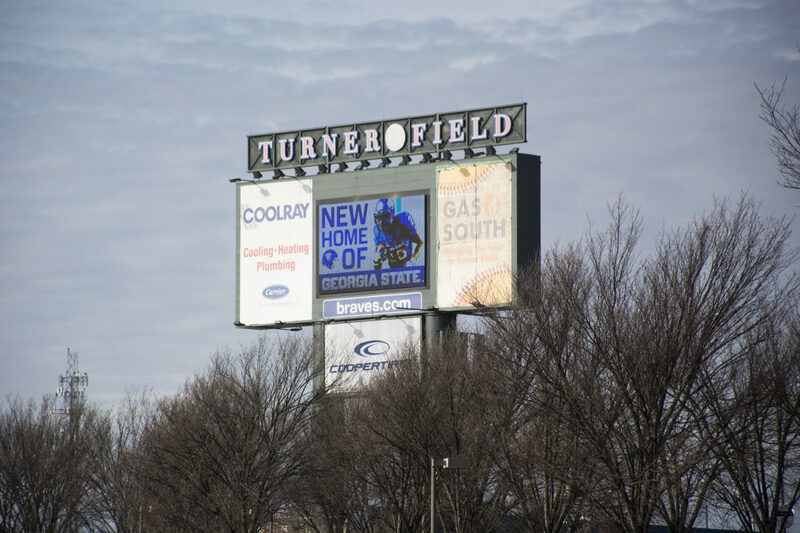 The optics of refurbishing The Ted, as opposed to demolishing and rebuilding a shiny new stadium, provide Georgia State an opportunity to show residents it wants to integrate with the community, not replace it. Georgia State Stadium is by no means set up perfectly for football. For example, seats are positioned to face the southwestern side of the stadium, which is where home plate used to be. Many of the stadium sections aren’t even in use. You may even find it odd to walk through Victory Plaza and see a statue of a baseball hero who never even attended Georgia State. Just remember the history of Atlanta that has been preserved by Georgia State. And after all, aren’t unusual traditions and oddities what make college football great? The Braves did not win the World Series at the Turner Field in 1995. They were still playing at the Atlanta Fulton County stadium when they won the World Series.